Home > Tools > You’re almost there. signing up is now required). Simply enter your name, email address and choose a password. That’s it. 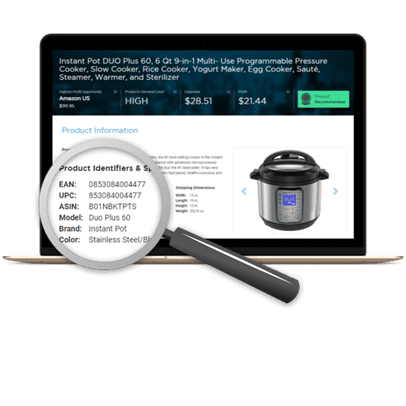 Our product identifier tool quickly retrieves ASIN, UPC, EAN and other crucial product information like best marketplace opportunity, market demand, expenses, and potential profit – quickly and accurately. With these insight, you can remove the risk of hurting profits with low demand stock and identify the products with the highest profitability opportunities. Gain access to our Bulk Analysis feature and upload CSV files with up to 200 identifiers on each to cut hours of research time down to mere minutes.